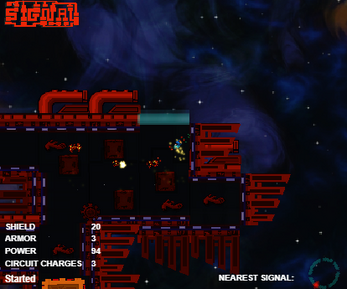 This time I decided to just have fun and make the Paradroid / Cryptark RogueLike shooter I've always wanted to make. Last time I was more trying to be sort of classically RogueLike. This has Permadeath, procedurally generated abandoned space station junkers populated by hostile robots that your probe can "take over" by capturing more of the robot's circuitry in a mini-game that happens if you try to interface with one. You start out at the easiest Junker. The goal is to blow up the main reactor (indicated by your compass at the lower right) in each of the space stations. Standard ASDW for directions. Mouse to aim your gun. Left-Click to fire --but you don't have unlimited ammo. Right-Click for shields. They only protect your front, and they go down FAST when you're using them so make shields count. They are regenerated slowly over time. Zoom in or out freely with the mouse wheel. Zoom in to see details of your battles but out far enough to see where you're going. If you're near a robot, you can hit the space bar and try to take it over. You will transmit a signal and then attempt to interface with the robot's brain. In the brain-game, you start out with 3 charges. The robot's red charges are distributed randomly on the circuit. You must strategically select 3 leads (square ends) and turn them blue, then hit GO. When it's activated the red and blue will spread along the circuit until they run out of green. Who ever ends up with more wins. If you are clearly winning or losing and you don't want to watch it play out just hit the space bar --the winner will be decided right then. If you win then you ride on top of the robot, and its weapon will fire with your own. It will also take some hits for you until it is destroyed. If you lose you go down to 1 Armor, lose a charge and you will probably die. So don't lose. Destroy the junk for power ups. Kill the reactor and get outta there at a safe distance. The scale of the game level feels really big, and I mean that in a good way. You should consider clamping the zoom feature so that the player can't scroll outside level bounds with the camera. I was able to destroy the game by simply scrolling out over and over again.